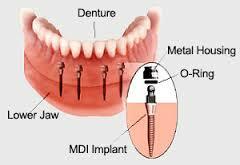 Mini implants are very small implants used to stabilize loose or ill-fitting dentures and partials. While not as versatile as standard diameter implants, minis offer a lower cost alternative that can be placed with minimal trauma and without the need for extensive bone grafting. If you’ve ever experienced the embarrassment of having a denture or partial fall out while you are talking or eating, then mini implants may be a good option for you. Call today and let us help determine if mini implants can give you back the confidence to eat and smile without worry.